If you have never used an induction stovetop or portable cooktop, then you are missing out. Having the best portable induction cooktop will save you on time, money and electricity. They are the most self-sufficient cooking sources available on the market today. Ever get sick of waiting for a large pot of water to boil, just so you can make a spaghetti dinner for the family quickly. Or maybe you live in a small apartment or a dorm room where ovens and stovetops are in short supply due to limited space available. Maybe you want to be able to cook on a portable device without having to use a portable grill. Well, the best portable induction cooktop will solve both of those problems at once for you. A portable induction cooktop is very small and compact so it won’t waste any counter space sitting out and can be stored safely in small spaces. When you need to use it to cook something, it will fit on any small counter space. An induction cooktop will also heat up and cool down very quickly, more so than any other heat source. This allows you to heat your pans very quickly and cook food very fast. Boiling water happens in a matter of seconds to minutes depending on the size of the pot. But the difference between an induction cooktop and any other cooktop is the speed at which the device can operate. 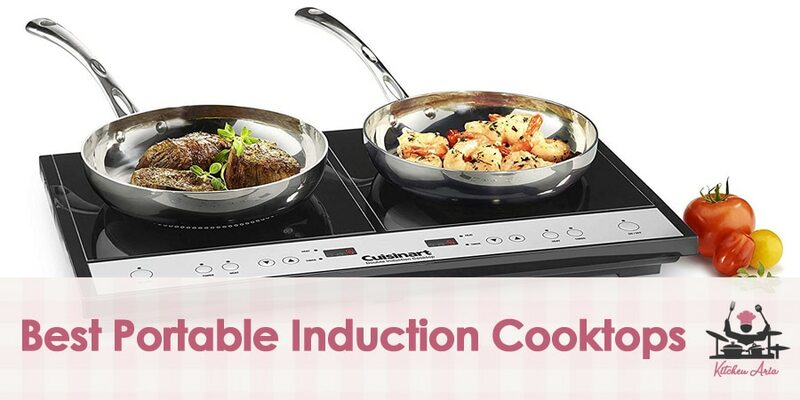 Learn more about how an induction cooktop works. In this article, we will go over some of the special features and options to look for when purchasing the best portable induction cooktop. We will also cover some of the models of portable induction cooktops available for purchase on the market today. Knowing what your situation is will help you to determine what type of portable induction cooktop you will need. There are plenty of different types of portable induction cooktops out there and each has special features that can handle specific jobs at hand. If you are planning to use one or several portable induction cooktops for a catering job where you will be cooking a large amount of food for people then you are probably going to want an induction burner with a lot of power output. You will probably want more than one as well. They do make portable induction cooktops that have more than one burner. However, by using one of these the power is cut in half and split between the two burners. If you plan on doing a lot of food and very quickly, you may want to invest in several single-burner, portable induction cooktops. If you are planning to use an induction cooktop in your home, apartment or dorm room then you may not need all that much power. You will definitely want one that is smaller and compact to fit in any space you may have. Also, for the induction cooktop to be used in a house or apartment building rather than outside, you will want to have some safety features that will protect you, the device and your home from any potential hazards. While there are many different portable induction cooktops available for purchase, they do have a few things in common across the board. They are very easy to use and very easy to clean. Yes, they are very easy to use, but for the most part, portable induction cooktops are very selective about what kind of pots and pans can be used on them. For the Induction heat process to work, the pans need to be compatible with the induction burner for it to work. For instance, the best types of pots and pans to use on an induction burner are going to be constructed of a ferrous metal like iron, cast iron and in some cases, stainless steel. These types of pots and pans are known as induction cookware. Other pots like copper and aluminum will not work on an induction burner. However, there are some of the portable induction burners that can use all types of metal pans. If you do use a different type of metal the heating process will not be induction but rather a conventional burner. To learn more about what types of cookware you can use on an induction cooktop, click here. A portable induction cooktop with proper safety features is very necessary when cooking inside your home. Some of the induction cooktops will have automatic shutoff burners after a set amount of time a pan has not been in contact with the burner. This will help in case you forget to turn it off. Just make sure the shutoff timer is longer than 10 seconds to spare you the trouble of turning it back on every time you lift the pan up to move it around for a stir-fry, flip pancakes or any reason. There are some other safety features that may come in handy as well such as fully locked buttons and switches that usually don’t come with a home induction range. This will help to not accidentally change a setting while you are cooking, or if a child happens to come in contact with the device, they can’t accidentally turn it on. Another great feature to have would be some sort of rubber stoppers or nonslip surface for the burner to sit on while in use. This will help it from sliding around while you are trying to cook foo which in turn can be very dangerous. A warranty will help to protect your portable induction cooktop when it breaks. Most quality manufacturers offer a lifetime warranty with their machines because they are confident it will last forever. If the machine does not come with some sort of guarantee or warranty then it is pretty clear that is a red flag and should not be considered as a reliable product that will outlast the test of time. This product has to be one of the best portable induction cooktops available for purchase right now. It is very reasonably priced and has great reviews from all its customers. The cooktop comes with a standard 5 ft cord that can be used in any home setting. The device is also lightweight and compact, making it easy to maneuver and handle. The cooktop also requires that only induction cookware can be used on the device. If any other pan or pot that is not compatible with the device is being used, an alarm will sound and the device will turn off. There are also child safety locks on the device itself making you press and hold buttons for 3 seconds before they turn on. The device has settings that make it possible to turn the heat up or down in 20-degree increments from 100 degrees to 460 degrees. This makes it possible to boil a full pot of water in under 1 minute. Here is another great option for an induction cooktop. This one is almost identical to the previous one except it is about half the cost of the other one but also has about half of the temperature settings. While you can still change the temperature from 100 degrees to 460 degrees, you can only do this in 40 degrees increments giving you a total of 8 power level settings. This won’t matter too much because it is still relatively close in degrees for the temperature to cook with. This portable induction cooktop also comes with a 1-year warranty instead of a 2-year warranty like the other product. This is still a great option to purchase since it still has all the same safety features and cooking features. Here is another great portable induction cooktop that costs about 20 more than the last one and does just a little bit less. The temperature range for the cooktop is between 140 degrees and 460 degrees, so it will not do lower temperatures like the others will. But it still is used in 40 degrees increments. This portable induction cooktop has all the other features the other ones do like; a built-in timer up to 170 minutes with 1-minute increments, auto pan detection and a diagnostic alert system for warnings. But this cooktop comes with a 2-year warranty instead of a 1-year warranty to protect it from any damages or defects that may occur while in use. This portable induction cooktop would still be a great option to purchase. All the previous customers have been very happy with their product and the reviews show it. This one is a little bit different than the others we have been looking at. A lot of the features are the same but are divided because this is a dual sided portable induction cooktop. There 8 power level settings for temperature and heat on the left burner and 5 power levels for the right burner. The left burner is intended to cook using larger pots or pans than the right burner uses. Both of the burners have 150-minute timers each, able to be changed within 1-minute increments. There is a bright LED display for all the timers and alarms, an automatic shutoff default and child safety locks. While this may be a good product, it is larger, more expensive and the power it pulls will always be divided between the two burners. Not like having all the power to one burner. There also is no warranty to protect it from any damages or defects. Here is a very cheap and not so bad induction cooktop. If you are one that doesn’t need anything too fancy with all the bells and whistles, then this portable induction cooktop may be the one for you. It is able to have the temperature altered using 8 power settings within 50 degrees increments. These may be used between a temperature range of 150 degrees to 450 degrees. It is also equipped with a Bright LED display. The display will read out alerts for hazards and alarms for the 3-hour built-in timer. It also has overheating protection and induction cookware detection with automatic shut off. The machine does not have any child safety locks or alerts which may become a problem. It also does not have any warranty to protect it from any damages or defects that may occur while in use. This induction cooktop is a sleeper on our list because it is further down the list but is actually a really great deal. It is moderately priced well and has a lot of the special features you look for in a portable induction cooktop. It has the ability to change the temperature of the device using 10 different power levels between 140 degrees and 464 degrees. They claim it only takes 50 seconds to boil a full pot of water. The device is equipped with child safety locks and an active variable cooling system to ensure no accidents or hazards happen. The device has rubber stoppers on the bottom so it will stay in place when in use and not slide around. It also has a 1-year warranty to protect it from any damages or defects that may occur while in use. Here is an even simpler and more basic version of the portable induction cooktop. It does not have a lot of the special features you would want, but maybe you don’t need them. It does have child safety locks and automatic shut off detection to prevent any accidents from happening while using the device. You can also change the temperature of the device using 10 different power levels of heat up to 450 degrees. It also has a timer that goes up to 180 minutes. It does not have any warranty to protect it from damages or defects, warning alarms for caution and no quick cooling system for safety reasons. This is a very basic machine and is very cheaply priced rightfully so. Here is a pretty nice portable induction cooktop that is designed a little differently than the others. The other cooktops we have reviewed so far have been rectangular and square shapes while this one is a 9″ round cooktop. It has a huge temperature range of 100 degrees all the way up to 575 degrees and may be changed using 10 different power levels along with 6 pre-programmable heat levels for your favorite dishes. This device has alarms, timers and safety features to boot. Plus, it comes with an instructional DVD, cookbook and 10-inch compatible frying pan. It, however, does not have any warranty to protect it and is much more expensive the rest of the portable induction devices we have looked at. This device has it all and then some. It does everything we have talked about but a couple of fallbacks. It has a 180-minute timer and has the ability to change the temperature using 10 different power heat levels between 100 degrees and 450 degrees in 25 degrees increments. It also has every safety feature such as childproof locks, overheating detection and pan incompatibility. While this machine does have all the bells and whistles, it is the most expensive portable induction cooktop we have looked at and it does not come with any warranty to protect it from any damages or defects that may occur. This portable induction cooktop comes very reasonably priced but with very few features. It does, however, have a very large temperature range of 100 degrees up to 550 degrees that can be changed within 10 degrees increments. This is the closest degrees increment of any other portable induction cooktop on the market today. It does have a timer a few presets for heat and time but that about it. It does not have child safety locks, alarms or warning systems, automatic shut off detection or auto pan detection. It also does not have any warranty protecting it from any damages that may occur while in use. Whatever portable induction cooktop you decide to go with at least make sure it is reliable. Having a portable device that won’t work just seems pointless. Make sure you are comfortable with the induction burner as well. These are dangerous machines and need to be utilized properly and safely. Knowing how induction works and how to use it will make all the difference.